You can add signature chat for the mails sent from Zoho Mail. You Just have to copy the link from the Zoho SalesIQ and Paste it into the right directories. How do to configure Zoho SalesIQ Email Signature? Select the "Signature" tab from the personalize. Click on the "Insert Image icon", Select the option "From Web URL". Copy and paste "Image URL" from your Zoho SalesIQ embed settings. Copy the "Link URL" from Zoho SalesIQ and paste it and hit "Ok". Give a suitable Title and hit add. Now your Zoho Mail is equipped with Zoho SalesIQ Signature Chat. 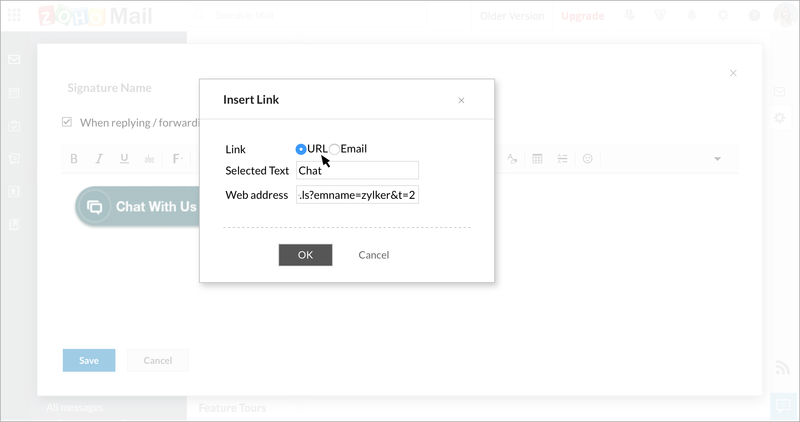 We give you unique snippet code for each specific Signature chat embed. You simply have to copy and paste that code into your right Signature directories, to get the Signature Chat in your mails which you send. 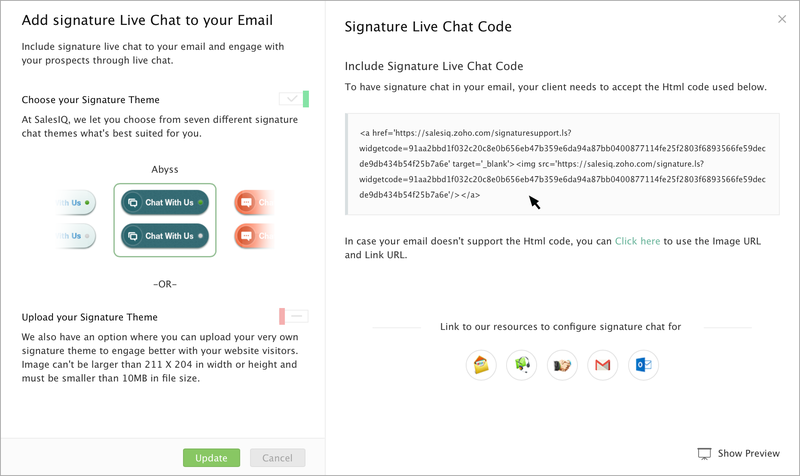 Navigate to Websites -> Choose a website -> Live Chat for Emails -> Signature Live Chat Code. Copy the signature chat code and paste it in your Email signature directories. Signature Chat Code – This is used when your email client accepts Html Code to get the signature from SalesIQ. If your email does not support the Html Code, then use the Image URL or the Link URL. Image URL – To pull out the image from Zoho SalesIQ to your Email Signature. Link URL – Add this Link URL to the Signature Image to open up a signature chat page for your email recipient on clicking over it.